A bold new approach to breeding the rare Cornish chough is proving remarkably successful. For the first time in more than 50 years, two pairs of choughs have raised chicks on the coast of west Cornwall. 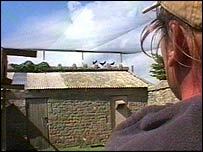 The project's success is largely due to the efforts of Paul Carter who has built a special cliff-top aviary for the birds at a secret location. The chicks are the offspring of birds from Hayle's Paradise Park and are left to become as wild as possible. Mr Carter has developed a regime of wild food feeding, finding grubs to mix with mealworms and crickets. He said: "It is six in the morning until nine-thirty at night, seven days a week come rain or shine. "It's a passion I suppose. "It's like your kids, you just want to see them do well.
" To see the Cornish chough back on cliffs again would be a dream come true." It is hoped the chicks can be released into the wild within three years to help bring the bird known as the King of the Crows back to the coast of Cornwall.